A day in the life of an artist with everything but the kitchen sink in her mind! Roger gets up at 5:30am along with the dogs. He checks his eBay and Fine Art America sites, lets the dogs out and makes coffee. At 6:30am Lola, our Newfoundland, comes in and stands beside the bed and woofs at me. My alarm clock. She's hungry! The day begins. I try and do "quiet time" when Roger leaves at 7 but that usually doesn't work. So I shower and dress and gather my supplies for painting out of doors. The place we were painting today is in Grant, Florida and absolutely gorgeous. 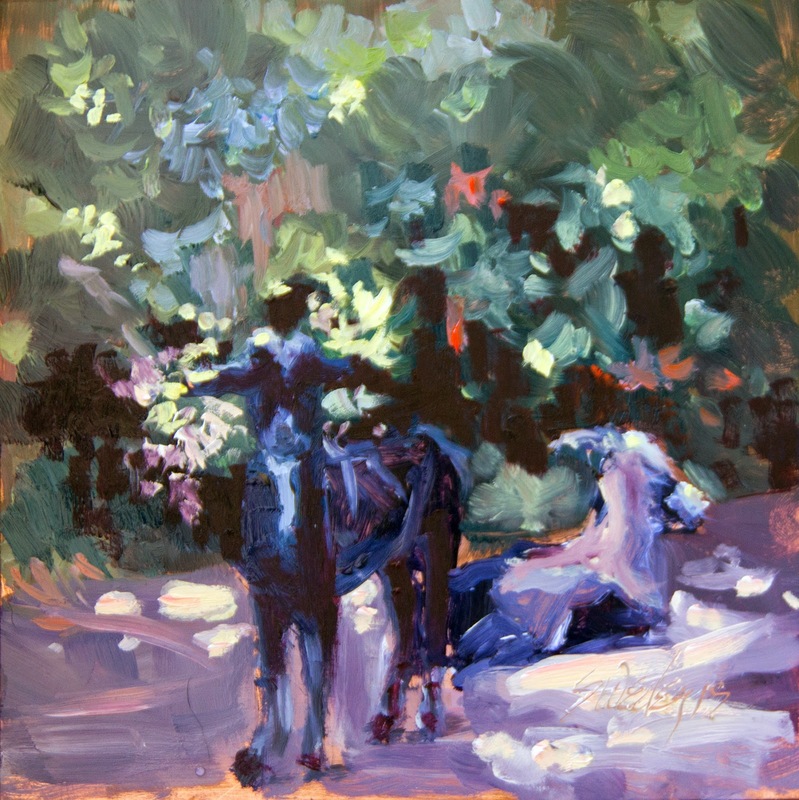 Pond, flowers, dogs, goats. Every type of flora and fauna. I chose the goats! He stood there baaa-ing and chewing most of the time. The beauty was so overpowering I just wanted to get the impression of the scene rather than doing a realistic piece. That's how I paint. Now, why copper as a substrate? Copper was used quite frequently in the middle ages since it was so plentiful and if it was treated properly would last 400 or more years. Unfortunately, not many artists knew how to preserve the paint on the copper and in time it dissolved. Rembrandt has a painting on copper and it looks the same today as it did the day he painted it. To me that's exciting. First, I get a sheet of copper cut to the size I wish to paint on then sand it to get a good tooth for the oil paint to adhere. Starting the process I work in glazes, this transparent strokes to get a good base of paint. Then I start to go to town! When it is completely dried I coat it with Galkyd medium and it "seals" it to the copper. Framing is done with acid free foam core on the back and it's good to go. This is a 12" x 12" oil on copper commission I just finished. Allot of copper showing. Such a nice feel don't you think? Tomorrow? Commission work at the studio and teaching a class in the afternoon. Now? Doing my daily search for RV's and going through some more stuff to throw. Oh at the place we were painting today they did have an RV. An older gas model. Rexhall. I'll have to do some research to see about that one. Just felt it was a sign that we are on the right path.! Dear Santa, (summer Santa) please let us win the lottery tonight so I can hire someone to shovel everything out and enough to get the RV of my dreams? What Santa?? Keep working Sheila?? You'll get there?? Beautiful painting of the goat. Love it. Thank you Lou! It was allot of fun!!! Good idea. Tomorrow when I go to my studio I'll ask my Blog Guru, (Lou) :-) to help me take that off. I know..it's irritating! Thanks for the suggestion!